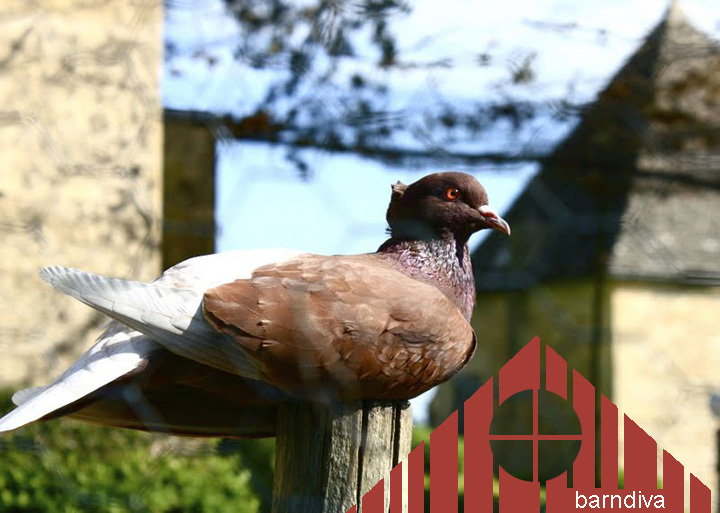 Squab may look like baby chicken, but with a thicker layer of fat beneath the skin these farmed gamebirds react to heat more like duck. Cooked properly the dark meat is rich and delicious. Before I tasted this dish the best squab I ever had was at St. John’s in London, where they grill and serve the heart and liver alongside the whole bird, as close to nose to tail as you get with poultry. Ryan used two kinds of sage in the dish. 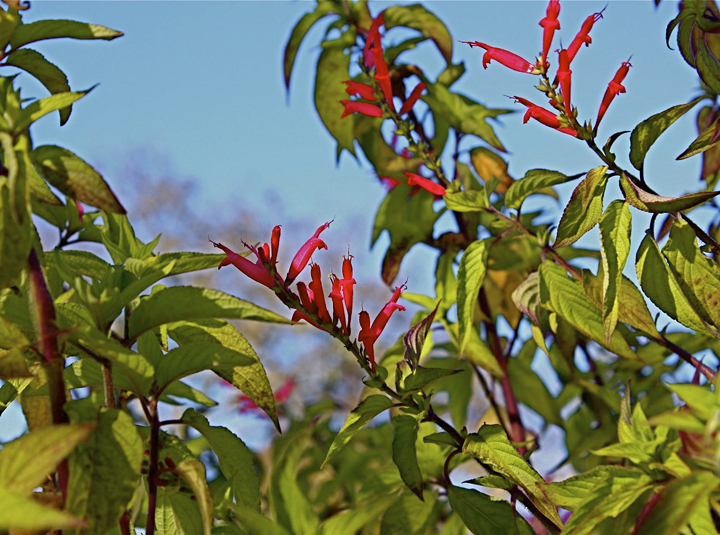 He stuffed the birds with garden sage before searing and oven roasting them; for plating, he pulled the petals off the flowering spikes of the pineapple sage we have blooming in the garden as if it were spring ~ probably as confused as we are by the unseasonably warm weather. Alongside the lush purple velvet of the huckleberries, the edible flowers added a tropical note of color to a dish which otherwise would have been all golden hued brown. We sourced our pineapple sage from one of Occidental Arts and Ecology's popular plant sales a few seasons ago. Its fragrant leaves are wonderful in cocktails. Chef cooked the squab in three stages. First, over high heat he seared the bird on all sides (including the ends), then popped it in the oven to roast before finishing back in the pan, basting furiously with garlic, thyme and butter as the skin caramelized. 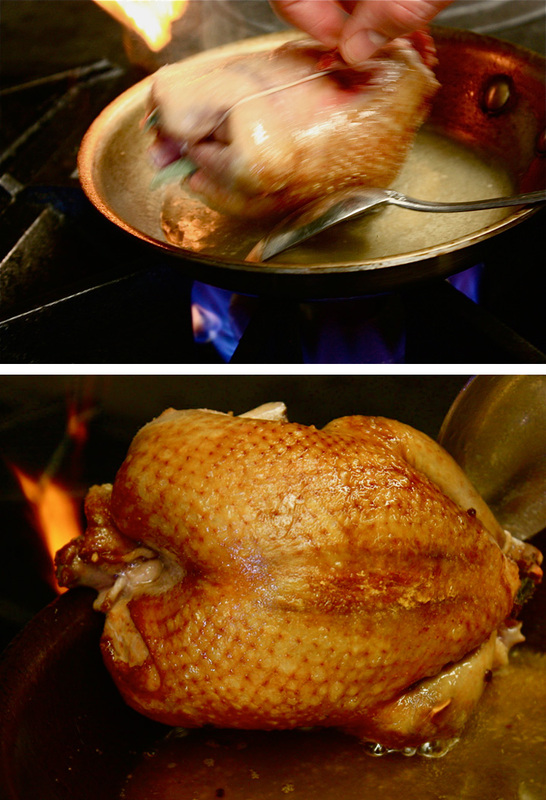 It's a labor intensive way to cook each bird but you can't argue with the result: a brilliantly crisp skin with meat the consistency of a medium rare steak. Seeing red when you cut into a gamebird takes some getting used to, but no worries: what the eye perceives as underdone, the mouth will soon convince you is moist and bursting with flavor. 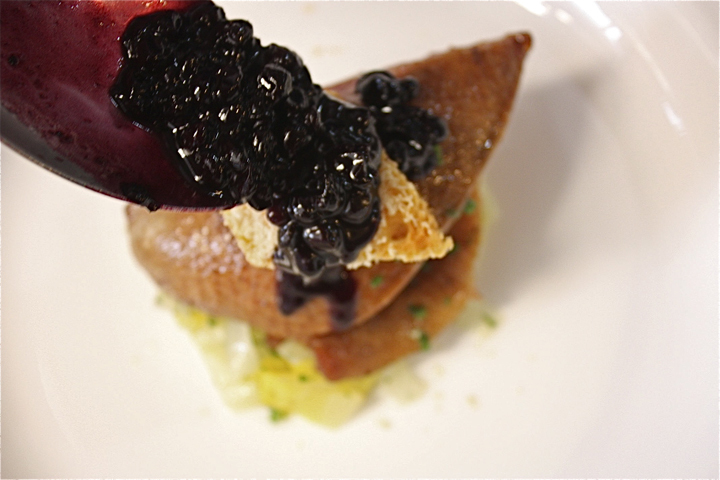 Ryan served the squab over a bed of sautéed endive. 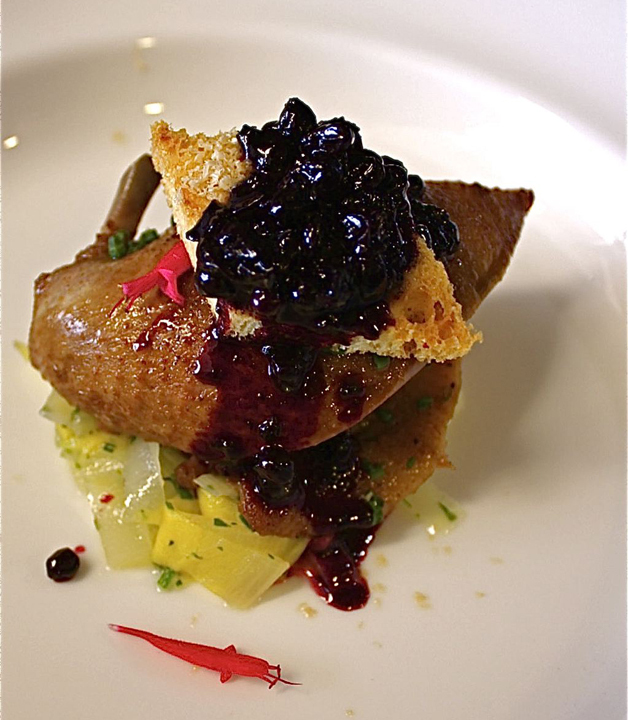 He balanced the breast of the bird over the leg and thigh, placed a triangle of toast on top, grated the fois and then dribbled huckleberry sauce over the dish like they were pancakes on Sunday. There was crunch and then creaminess from the shaved fois which bumped up nicely against the sharp tang of the huckleberries and the soft herbaceous notes of the sage. 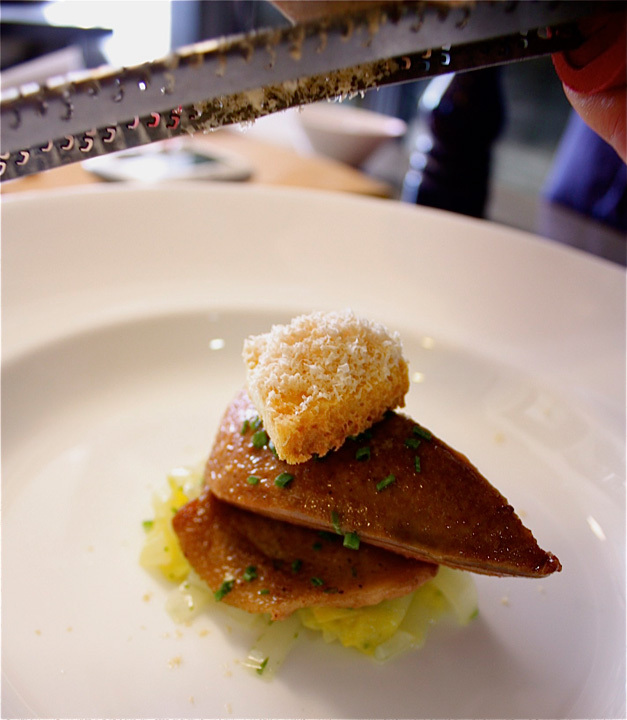 Surprisingly, if you take fois gras directly from the refrigerator and use a fine microplaner, it grates into flakes as light as snow. They melt on the tongue, playing off the subtle but distinctly gamy flavor of the squab. Strip away all the beautiful finesse Ryan brings to this dish and you could well imagine eating it on the ridge in Philo 100 years ago when all the ingredients could be found without leaving the farm. Though most of the larger animals have fled farther north in the last decade ~ it’s five years since we’ve seen a wild boar around our place ~ we still have small game birds in abundance, wild sage grows everywhere, and huckleberries line the road in from Greenwood Ridge, plentiful when the deer don’t get them first. Even in low water years, shaded by the towering conifers and redwoods, they are one of the great delights of foraging. Last week Rachel and I came up with a great cocktail for the Winter Menu called What A Girl Wants. 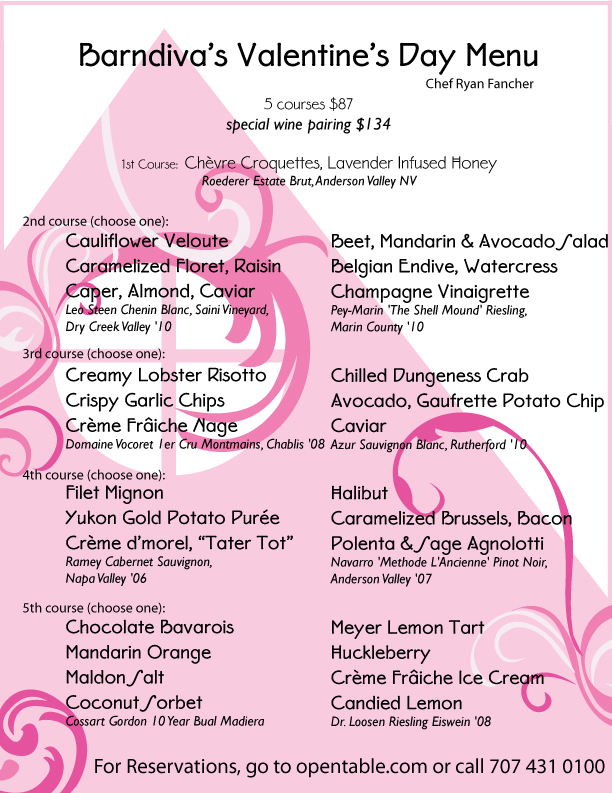 It would have been fine to star with the Valentine’s Menu, but I’m getting (happily) used to the fact that our new bar manager is never satisfied with one drink when she can come up with two. Be Mine? is without a doubt a more girlie drink than What a Girl Wants ~ which is fine, as the "girls" who frequent our bar come in all temperatures, cool to smoking hot. 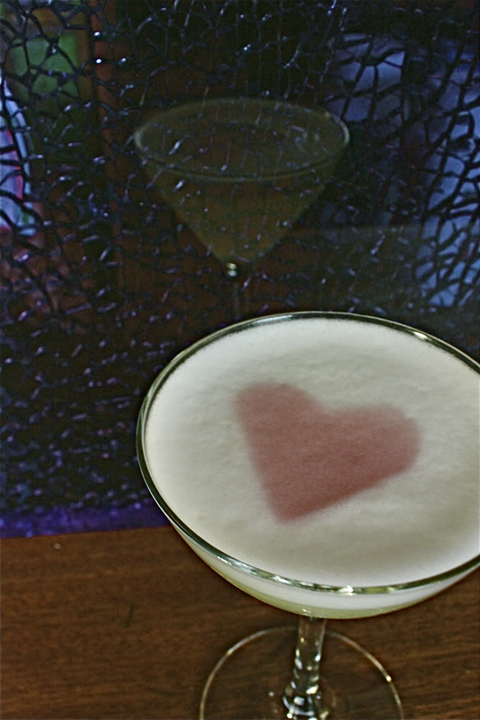 Made with Tito’s handmade vodka and fresh Meyer Lemon Juice, with a hint of lavender infused simple syrup, it’s finished with a foamy egg white which Rachel will use as a canvas on the night for a simple Crème Yvette heart. Click on menu to view. All text Jil Hales. All photos Jil Hales (unless otherwise noted). Valentine's artwork K2pdesigns.